A group of Evergreen Meadows volunteers and the Evergreen Meadows Homeowners Association (EMHA) invites all homeowners to share an afternoon with your neighbors at the Evergreen Meadows Fall Potluck Picnic on Sunday September 18, 2016 at 1:00 pm at the ballpark! Attendees are asked to bring their own drinks and a potluck item for themselves with enough to share with the other participants. The EMHA will provide a rented porta potty and bottled water. 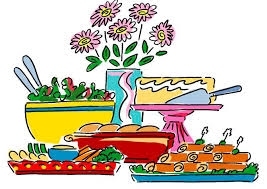 Please RSVP and sign-up your potluck item that you'd like to share at - Evergreen Meadows Fall Potluck Picnic and RSVP . Daily updates will be displayed on this page with a list of potluck items and people that have come through our RSVP and potluck sign-up form. There will be tables, chairs, canopies, games and lots of socializing and fun. If you have any of these items that you'd like to bring, please feel free and we expect a lot of people. Thanks to everyone responsible for bringing this event to our community and making this happen. Contact Jenny Somogyi at jennic01@yahoo.com with any questions.